With the announcement of Keet as the Season 3 Major Reward (see the post here), we thought it would be fun to show you guys a bit of his design process. So, welcome to Part 1 of Keet’s Corner: Designing an Adventurer! While most characters start the game with 10 gold, Keet instead gets 10 random artifact cards, which count as his gold. Each artifact has the potential to have an awesome ability, many of them beneficial but a handful of them dangerous! The tricky bit is that nobody, not even Keet, knows what those objects do at the beginning of the game. Throughout the game, Keet’s cards will let him “identify” (reveal) the various artifacts he has collected on the table in front of him. However, players who steal or win his artifacts will also immediately reveal them. So, players like Gerki or Fleck, who make a living off taking gold from their friends, will have multiple opportunities to try and steal a favorable artifact. This has the wonderful bonus of making gold and gambling even more important than they were before. As soon as Keet is at the table, there’s the potential to earn fancy new Action or Sometimes Cards by winning his artifacts in a round of gambling. Furthermore, one of the best ways for Keet to protect his goods is to win a gambling round himself, so he can have a buffer of a few actual gold pieces to protect his artifacts from pay or steal effects. When Keet showed up for the 2014 Character Design Contest, he really sparked our imaginations. The character had a very novel mechanic of replacing his gold with artifact cards that have abilities. This completely changed the dynamic of the game in a surprisingly unobtrusive way! 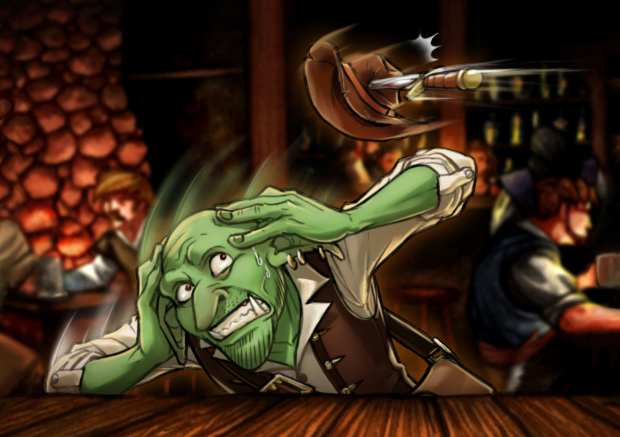 He also strongly fit the theme of the “friendly” monster, one that has come up in the tavern over the years. With a clear idea of his personality and an exciting, clever new mechanic, he ended up being chosen as the contest winner. Another ringing endorsement for the character was how simply he integrated with the game. Typically, characters with new mechanics are not suitable for players new to RDI. We don’t feel that’s the case with Keet. His new mechanic helps convince players to play with their artifacts and jealously guard them for themselves – the “my precious” factor. Meanwhile his deck works to support exactly this style of game play. He gives the player a ton of ownership, and that makes players old and new immediately engage with the game. So Keet was a character with tons of flavor, a mechanic that would excite veterans and a theme that is easy for newcomers to engage with. How could we deny this little tomb raider!? When we getting into serious playtesting mode, we run something called “The Gauntlet”. The Gauntlet is a long series of games where the new character is matched up against every other character in a series of one-on-one games. In the late stages of development, each new version of that character runs “The Gauntlet” again, and frequently characters will be put through it many many times. After a character is deemed worthy (i.e. gets about a 50/50 win rate against the entire cast) they are generally sent out to some hand-picked uberfans for further playtesting. Typically this is the shot where those characters see new eyes for the first time, and it’s our chance to “fun-test” the character. As a result, each character gets tons of hands-on play in-house and then even more externally before they see print. On the surface, Keet was doing everything we needed him to do to be a good character concept both mechanically and thematically. The problem was that he was just kinda bland and couldn’t actually win a game! When we put him through The Gauntlet he would be revealing plenty of artifacts, but would end up just getting drunk under the table or beaten down (or mauled, in Erin’s case). So he definitely needed a tune-up. The original version of Keet was quite narrowly focused, with most of his cards only interacting with his own artifacts or gold. Players would spend the majority of their time simply playing cards to flip over artifacts, rather than hitting their friends, gambling or dealing out drinks. Basically, he wasn’t getting to enjoy himself at the party! As a result, his opponent needed only to just keep serving him drinks and punching him in the nose to win. To solve this problem, we turned back to the first 8 (the cast of RDI 1 and 2) and drew some inspiration. We needed to make Keet more of a traditional RDI character so he could hold his ground against them. The current and most successful version of the artifact hunter now plays along with the party and pulls a fair win chance against the cast of heroes. Some of Keet’s new mechanics, while intuitive, were challenging to support with rules. These little corner cases were the challenges we faced while polishing the final version of Keet. Hidden Information: One of the mechanics we played around with early on with Keet was allowing him to peek at artifacts without revealing them. This gave him a lot more power as he could ante bad artifacts when he was going to lose a round of gambling or give them away to pay effects before they could affect him. The problem was that there was no convenient way to mark which ones Keet had peeked at and which ones were still unknown to him. The worse part was that players could accidentally cheat by looking at an artifact that they thought they had already looked at, and that’s a real feel-bad for everyone at the table. We ended up dropping the mechanic, but reimplementing it in a variety of other forms. For instance, Keet always peeks at an unknown artifact before anteing it in a round of gambling. This, in turn, lets him bluff a bit by changing how he plays based on what the artifact is. His “hit back” card also allows him to peek at a card before he decides to keep it or give it to another player. By allowing Keet to peek only right before he would reveal an artifact, we mitigated the information overload, while still letting Keet have fun by handing out surprises to the other players. Specific Gold: Before Keet, individual gold coin tokens didn’t matter. If someone stole a coin from you, you just gave them whatever. With the advent of artifacts, and how they can willingly (or otherwise) trade hands, we needed specific rules support for which gold is taken by “pay” effects. We played around with it both ways, and found that the victim choosing which gold is given is more fun. Keet has a variety of nasty artifacts, however; ones that cause no end of pain and suffering for their owners. We knew we wanted Keet to have the ability to drop off these negative artifacts on a poor adventurer, but we also wanted to make sure Keet had some ways to get back the positive ones that get stolen. Thus we created a unique problem for ourselves: If an opponent had both a positive and a negative artifact, how do we let Keet steal the one he wants if we’ve rules that the victim picks? We solved the problem in a couple of Keet’s cards. His “Let me take a closer look at that.” card lets him specifically steal the artifact of his choice, following the golden rule of gaming where the text on the card can overrule the text in the rules. We also gave him a Sometimes card that lets him take a artifact that a player just spent. This lets him cherry-pick the best artifacts that get stolen from him, and even, in the rare circumstance, take back a negative artifact to use again. Throughout the refining process, we have had the novel experience of running mechanics, thematic elements, and just about everything regarding Keet to a person outside of the company. Ben (the winner of the Design Contest and originator of Keet) has been included in nearly all communications and major design choices with the character. We wanted to make sure we stayed true to his original vision, while also guiding it to a very polished final product. It has been an exciting experience for all of us, and is one we hope to revisit with the Honorable Mention characters when/if we get around to implementing them in the game. Keet is going to be one of the most exciting Allies to hit the Red Dragon Inn. If you are eager to try Keet before he hits store shelves in mid-to-late 2016, you can earn a copy for yourself through our SlugCrew Program. Run demos to teach RDI to new players at your local stores or game conventions and Keet can be yours! Check back with us next week when we launch into Part 2 of Keet Corner: Look and Feel.